How much would you pay to consistently get better sleep each night and wake up feeling energized? I don’t know about you, but I can’t even put a price on good sleep because it’s invaluable. With that in mind, it’s no mystery why the best-selling deb pillow on Amazon’s entire site costs $59.99. They say you get what you pay for, and smart people are more than willing to cough up a little extra cash to get a high-quality pillow. 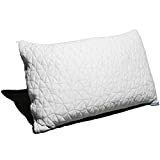 Sure, there are plenty of pretty good pillows out there for less, but if you want the best we highly recommend that you check out the Coop Home Goods Premium Adjustable Loft Shredded Memory Foam Pillow. I’ve been using one for a few weeks now, and I don’t think I can ever go back. Cover is 60% Polyester, 40% Rayon Derived from Bamboo. FULLY ADJUSTABLE PILLOW with our PROPRIETARY MIX of SHREDDED VISCO ELASTIC MEMORY FOAM and SILICONIZED MICROFIBER – ADD or REMOVE foam to adjust to your comfort, for a perfect custom-made pillow each time – for all sleep positions – eliminating neck and shoulder pain and sleep better throughout the night. Promotes proper alignment allowing deeper sleep through the night. *PATENT PENDING Our Soft Bamboo-derived rayon covers Allow greater ventilation providing a cool sleep all night long. ARE WE ALL THE SAME SIZE? No…. so why are we sleeping on a one size fits all pillow? Coop Home Goods pillows are completely customizable to provide the perfect pillow whether you are a side sleeper, back sleeper, stomach sleeper or all-around sleeper. Our pillow will adjust to you and conform orthopedically to provide the perfect amount of support for your neck, shoulders, and head. Stop waking up with neck and should pain by buying the best pillows for sleeping today!! REST ASSURED – CertiPUR-US Certified Foam. Our pillows are made without ozone depleters, PBDEs, TDCPP, TCEP flame retardants, mercury, lead and heavy metals, formaldehyde, phthalates regulated by the CPSC, or CFCs. Our foam has been analyzed by independent, accredited testing laboratories. WHAT IS IN YOUR PILLOW? Our pillows meet the CertiPUR-US standards for content, emissions, and durability, and are analyzed by independent, accredited testing labs. BACKED BY THE COOP HOME GOODS GUARANTEE – We produce high-quality pillows right here in the United States and guarantee you’ll love the pillow, if you aren’t absolutely satisfied, return it within 100 days for a refund, no questions asked. Backed by a 5-year warranty!! Cut Size measurements of pillows: Standard Pillow measures 20 inches x 26 inches. Queen size measures 20 inches x 30 inches. King measures 20 inches x 36 inches cut size.